Fused glass can be made into traditional leaded and stained glass windows, full size windows, doors, glass bowls, tiles, sculptures and lighting. 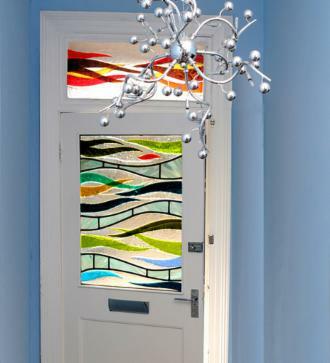 Fused glass and leaded glass door panel and transom light. (Hand blown St.Just glass and English antique glass). 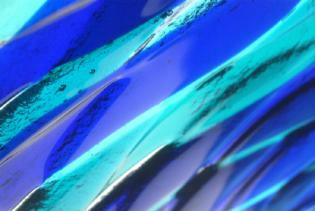 Blue and turquoise fused glass lightbox detail. 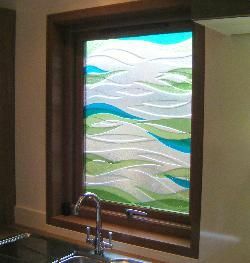 (L) Fused glass wave design kitchen window. Dalry, Scotland. 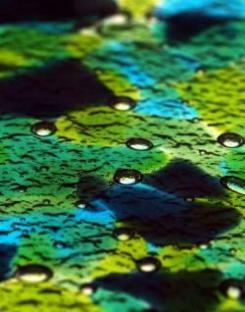 (R) Detail of fused glass, green turquoise and blue. This bed is approx 2.5m x 2m, is made from solid Scottish oak and has a fused glass backlit headboard. The bed was made by Alan Cruikshank from a wind felled tree in Mugdock Park near Glasgow, Scotland.